At Little Genius Montessori, we believe that tomorrow’s future is in the hands of today’s children. Establishing the right foundation at a young age guarantees little minds grow into little geniuses. Our Montessori Classroom is designed to meet the developmental needs of each child. 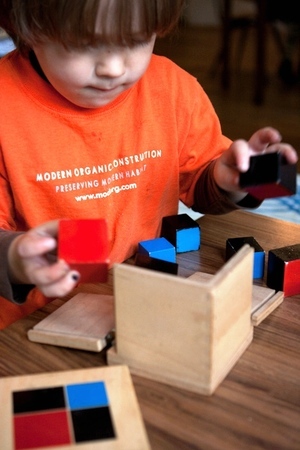 Learn how Montessori education provides hands-on learning below. Montessori classrooms are interactive environments in which hands-on exploration is not only encouraged, it is necessary. By using the mind, the body, and the senses, learning becomes an activity that engages the whole self. Any parent will agree that children do; Montessori environments follow this natural inclination of children towards activity by offering an appropriate variety of objects and activities for meaningful engagement. Little Genius Montessori offers extended care hours from 6:30 a.m. to 6:30 p.m., full-time & part-time schedules are available. Also, integrating healthy, nutritional food choices into snacks & meals is an essential part of assisting proper growth for our children. Click to learn more about our Montessori Programs. SRC: Click to learn more about the inside of a Montessori classroom. So true, little kids learn from their early Montessori classes and from there they can become a genius one if they got a perfect attention from the teachers and the parents. During all my early childhood teaching experience, I realized that children learn more hand-on experiences and less from what you teach them in the class. These activities are essentially important for their mental and physical growth.